Home / Editor's Choice, Entertainment News, Featured Articles, Gossip and Drama / See how petrol station attendants are stealing from unsuspecting motorists, You are probably a victim (PHOTO). See how petrol station attendants are stealing from unsuspecting motorists, You are probably a victim (PHOTO). Monday, August 13, 2018 - Next time you go to fuel in a petrol station, be careful. Petrol station attendants are stealing from unsuspecting motorists who are not keen enough when their cars are being fuelled. 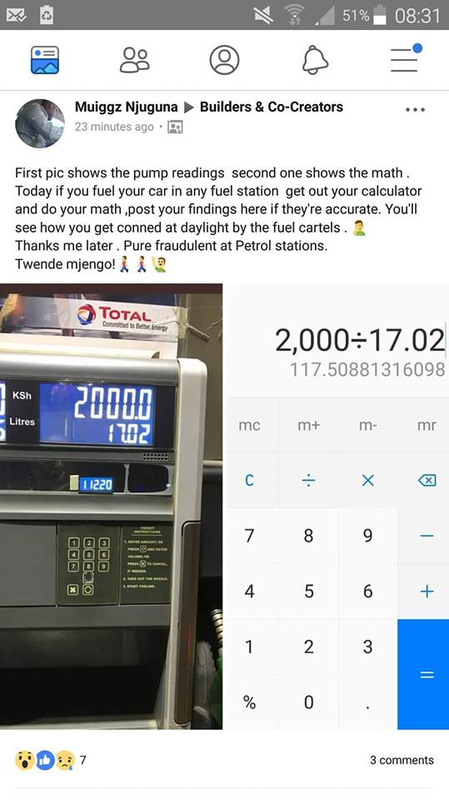 You can clearly see that in this petrol station, the fuel is being sold at Ksh 112 per litre but when you do the maths, the motorist has been conned. He has been sold the petrol at Ksh 117 per litre. This is happening in most petrol stations and so you should be careful. Really?!! Let us shame them then... hii nitaangalia na macho yote mbili going forward!